As a designer of any kind it is important to stay on top of the colors trends for every season. This fall I’m delighted that the hottest color for the season is purple. Purple gives a feeling of romance and femininity, it is also associated with royalty, regality, and nobility. And what better color to be set against all of natures golds that it gives us with the changing leaves!? 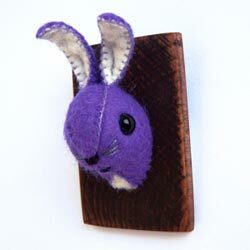 For my own contribution to the trend, I have created this Purple Miniature Bunny Rabbit Feltidermy or Brooch! Decorate your Blythe’s house or yourself with this little cutie! 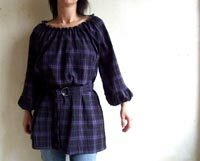 ~The Montmartre Plaid Painter’s Dress from tortillagirl is just adorable! Worn as a sweet little dress or belted with your favorite jeans, it would be a great addition to anyones wardrobe! ~Want something you could take from the office to a night out on the town? I think The Phoebe in (Deep Purple) from snoozerloser is the perfect find! 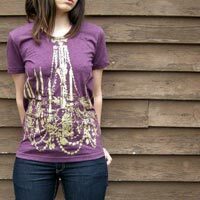 ~Maybe your more of the t-shirt kinda girl… This Chandelier print gold purple t-shirt from PrettyRaccoon should fit the bill. ~If color in our accessories is more you thing, these would be the perfect splurge for fall! Make a statement with custom purple and green sandals from zerkahloostrah. In custom made shoes you could feel like Cinderella at the ball anytime you wish! These purple wonders are fantastic and your latest bunny rabbit is stylin’ in its purple goodness! I’m honored to have my Montmartre featured here, girlsavage. Thank you so much! Love that chandelier print shirt! Oooh, that purple shirt from snoozerloser is awesome. Lovin’ the tiny purple bunny! Let’s see Chippy in all his/her fall splendor! I think we snapped a purple foliage shot on the lift…it might have been when Chippy was examining the rocks below.